If you want to get know Cancun, Mexico, you are the right page. Find about the city's attractions, best spots to eat, drink and shop as well with travel tips. From a deserted island to a premier tourist destination – Cancún’s growth as a popular travel spot in the last twenty years or so has been phenomenal. Nestled in the north-eastern corner of the area known as the Mexican Caribbean, Cancún has much to offer the visitors in the form of stretches of unspoiled beaches, the warm blue waters of the Caribbean Sea, an exotic marine world, lush tropical forests and the lost world of the Mayas. Dotted with Mayan temples and other archaeological sites Cancún is aptly called “El Mundo Maya” or the gateway to the world of Maya. With world class vacation facilities and multitude of tourist attractions Cancún today is the most flourishing city in the Yucatán Peninsula. It is also a major tourist draw, rivalling and often surpassing even the Bahamas and Puerto Rico. Cancún is distinctly divided into three main zones – the Hotel District, the Town and the Ecological Reserve. The Hotel District is by far the most crowded place in Cancún with major luxury hotels and shopping centres being found along the Boulevard Kuculkán that runs the entire length of the 21 kilometre island. With the most popular discos, trendiest restaurants and the best entertainment on offer, this place is always packed with vacationers enjoying life to the fullest. The Town of Cancún is for the permanent residents and you can catch a glimpse of the real way of life here with the shops and restaurants offering typically local fare. The Sian Ka'an Biosphere Reserve is Mexico’s largest ecosystem reserve proliferating with diverse plant and animal life. Apart from geological sites, archaeological sites can also be found in its midst that tell the story of the rich culture of the Mayas. Cancún offers visitors a vacation brimming with luxury, elegance, adventure, culture, history and the traditional warmth of its people. What more does one need? A very popular tourist destination with its white beaches and warm blue waters Cancún is a part of the Mexican Caribbean and is located in the state of Quintana Roo in Mexico. One of the most romantic ways by which you can reach Cancún is to take the sea route. There are many companies that run cruises to Mexico and you could arrive at Cancún through the ports of Acapulco, Cozumel, Mazatlán and Puerto Vallarta amongst others. You could also travel to Cancún by air as the international airport at Cancún is well served by a number of international air carriers and charter flights. The airport has some great duty free and souvenir shops too. Situated at a distance of 16kms from Cancún city and only 10kms from the hotel district, the airport is well connected to the city by shuttles, airport buses and private taxis too, but your hotel may also offer airport pickup and drop. Whether you want an idyllic vacation or an adventurous one, Cancún has activities to suit all needs. If you are a water sports enthusiast then Cancún has some of the best diving and snorkelling in the world. You can even hire your own sailboat for a day of adventure in the sea or enjoy a dreamy sunset cruise. 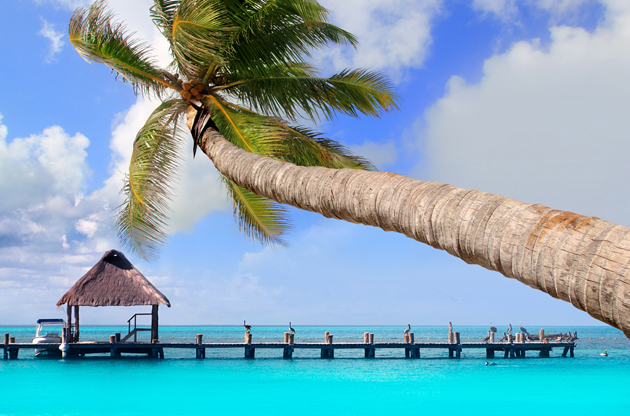 Cancún boasts of lovely pristine beaches with warm, turquoise waters that are ideal for relaxing. While on the beach you can also indulge in some shopping as vendors sell items like sea-shells, sarongs and jewellery on the beaches, but bargaining is a must to get the best price. For those looking for adrenaline-charged adventure, Cancún offers some of the longest zip lines in Latin America, along with mountain biking, jungle safari, and swimming in cenotes or sinkholes. Cancun has something for history enthusiast! If history is your forte then the rich cultural tapestry of the Mayans, still shrouded in mystery, is there for you to explore in sites like Chichen Itza, Tulum and Coba to mention a few that are easily reached from Cancún and form a part of regular sightseeing tours. Cancún’s Waters Interactive Aquarium in the hotel district offers you a chance to observe marine life closely and even lets you swim with the dolphins, pet rays, and touch starfish. At Xcaret, which is an eco-archaeological Park at a distance of 76 km from Cancún, you can appreciate the local flora and fauna, alongside different remnants of Mayan culture. There are also various other activities that you can take part in, some of which are snorkelling in underground rivers, enjoying the beach, visiting the butterfly pavilion, admiring the orchid greenhouse, and the Mayan village. For an extra fee you can also swim with the dolphins and enjoy the Temascal and Spa services. And once the sun dips in the horizon you can enjoy a spectacular night show featuring a number of performances depicting ancient Mayan culture alongside traditional Mexican music and dances. Grand shopping malls, exclusive boutiques and local stalls all form a part of the Cancún shopping scene. Market 28 is the local market in the downtown area, which is great for souvenir shopping but you must be prepared to bargain. At Cancún you will find plenty of duty-free stores selling exclusive items at discounted rates. Some goods that make very good gifts are hand woven material, leather goods and silver jewellery. Please be aware that shops are generally closed between one and four in the afternoon for siesta. Cancún restaurants offer a wide range of gastronomic delights from high-end classic dining, to traditional Mexican restaurants and food chains like Chili’s and McDonald's. Avenida Tulum and Calle Yaxchilan are full of restaurants serving local fare where you can have delicious Mexican food while being serenaded by Mariachis – a not-to-miss experience. Cancún claims to have some of the best nightclubs in the world and clubs like Cocobongo, Dady’O and The City are amongst the most popular, with live performances, fantastic music and great bars. Apart from these clubs, there are others too, playing everything from salsa to R&B, to disco to suit all ages. Chichén Itzá Archaeological Site is a must-see Maya archaeological site full of magnificence and grandeur. You could visit the site as a part of a day trip from Cancún or spend a night at a hotel in at Chichen to savour the atmosphere. Tulum is another major Maya archaeological site and being near the Caribbean see gives you a chance to explore the ruins in a beautiful scenic setting. High season in Cancún is from December to April when both air fare and hotel tariff increase drastically and the place is packed with vacationers. At the airport, do not give you bags to any of the local people offering to carry the same for you. Be cautious of touts who will immediately surround you as you emerge from custom clearance. Proceed to the official information centre for help. Cancun hosts a large number of international congresses, conferences, symposiums, fairs and trade shows every year. By doing so, this gorgeous city gives the opportunity of discovering one of the paradises on earth to the event attendee. The high tech equipped venues and good quality hotels never disappoint when it comes to satisfy the event atendees' need.